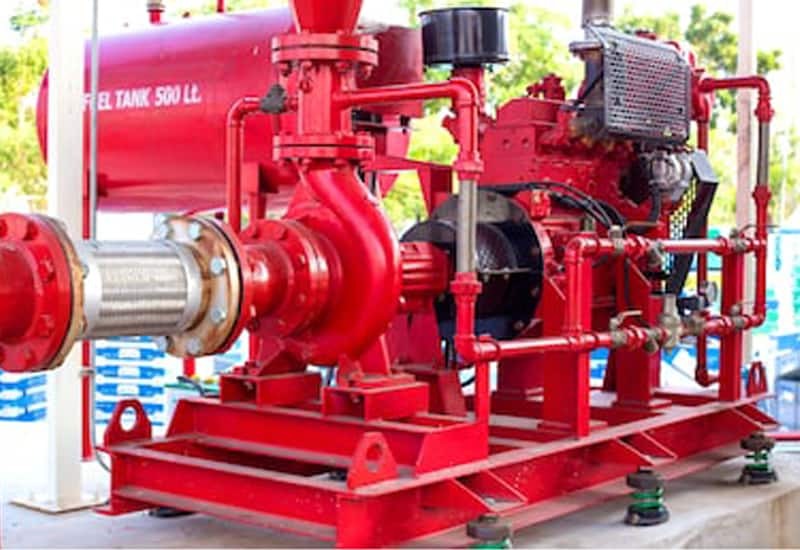 Fire pumps are available in diesel and electric types, and range in size and GPM output. They are often installed where the water supply is not adequate to meet the sprinkler system demand. Fire pumps and associated devices are needed to be periodically inspected, tested, and maintained by Standard for the Inspection, Testing, and Maintenance of Water-Based Fire Protection Systems. Fire pumps must be ran weekly/monthly and inspected annually to make sure the equipment operates as intended. Annual fire pump testing verifies that your fire pump is operating correctly and will be able to respond to a call to service. Despite whether you have a diesel or electrically driven fire pump, there are a few things you can do to guarantee the annual test is meaningful. Especially if your building is a highrise, then water pressure tends to be lower. Therefore, installing a fire pump is needed to maintain the required water pressure level. By boosting water pressure like this, a fire pump makes sure your sprinklers and standpipe system functions appropriately in case of a fire. Our fire protection technicians have the skill and knowledge of inspecting and testing fire pumps to meet industry standards. We not only examine and check your fire pumps but also provide you with a detailed report and take care of any repairs. Water reservoir: maintain it at proper levels. To prevent false alarms, We need to provide a signal for testing to the alarm monitoring facility before and after completion of the fire pump tests. After the fire pump examinations, our professional will confirm that the company received all fire pump signals. Reliable Fire & Safety’s ASTT-certified fire protection technicians have the knowledge and expertise for installing, maintaining, inspecting and testing fire pumps. Any deficiencies are included in a detailed report and repairs are completed to ensure all requirements are met.